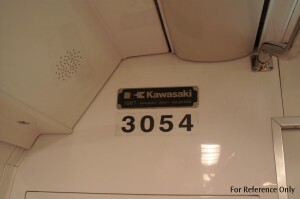 The Mass Rapid Transit Corporation tendered for their first passenger rolling stock in 1984, with final cost of 581.5 Million Singapore Dollars awarded on 12th April 1984 to Kawasaki Heavy Industries Ltd/Kawasaki Heavy Industries Rolling Stock Company (川崎重工・川崎重工業車両カンパニー)(Kobe, Hyogo Prefecture). 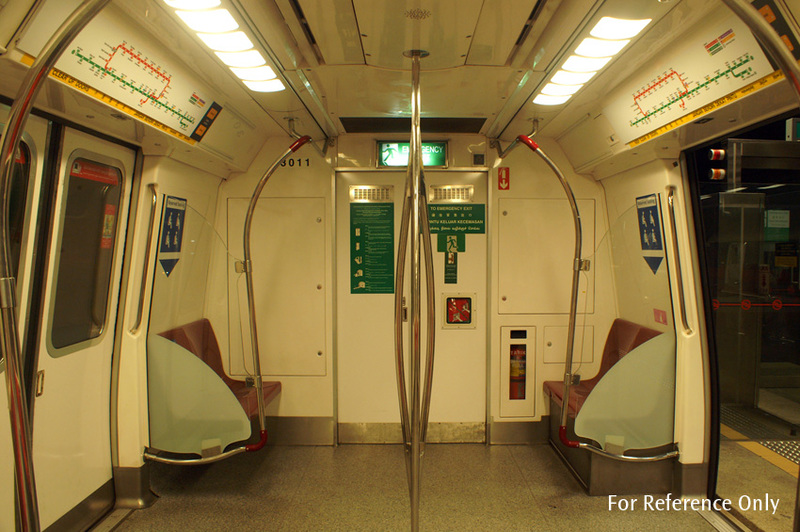 Many of these design specifications were carried on to the subsequent rolling stocks that MRTC/LTA tendered. Hence it is logical to say that Contract 151 sets most of the specifications for the mainline rolling stock. The car-body is manufactured from welded aluminum, each car can carry 320 passengers (1920 passenger per train) and have a maximum axle load of 15 tonnes. Although Kawasaki Heavy Industries Ltd/Kawasaki Heavy Industries Rolling Stock Company (川崎重工・川崎重工業車両カンパニー) was awarded the tender, the manufacturing of the trains were divided to include three other manufacturers in Japan, Kinki Sharyo Co., Ltd (近畿車輛)(East Osaka, Osaka Prefecture), Nippon Sharyo, Ltd (日本車輌)(Nagoya, Aichi Prefecture) and Tokyu Car Corporation (東急車輛)(Kanazawa, Kanagawa Prefecture). Design is uniform through all manufacturers. Each motor car bogie (supplied by Siemens) is constructed using H frame steel plated and carry two DC motors connected to the gearbox using WN (Westinghouse-Natal) couplings, known as the WN Drive. The axlebox primary suspension consists of bonded rubber/steel chevron springs, secondary suspension single convolution air springs. This forms a bolsterless bogie construction. Electric current collectors are located on the bogie frame, with one unit on each side. Single pusher tread brake units are provided at each wheel. The brake system consists of an electro-pneumatic friction service brake, electric regenerative and rheostatic service brake, pneumatic friction emergency brake and automatic, spring-applied-air-released parking brake. Static Inverters are mounted on all motor cars, providing 110 VDC and 240 VAC 50 Hz converted from the 750 VDC supply. Two independent split type air-conditioning unit provide each car with 66500 kcal/h (approx 77 kW) cooling power. Evaporator fans mounted on each side of the car can be operated on battery power with the failure of the 750 VDC supply to provide emergency ventilation. The Electric Chopper was first developed in Japan in the late 1950s to combat heat and electricity consumption problems, particularly important to subway systems. Imagine the heat rising from the trains as they slow, stop and move off in the station would be enough to discourage the commuter from taking the railway again! Chopper technology first came about with the Cam Chopper, using a combined cam and resistor system to control electric current, varying it at speeds. 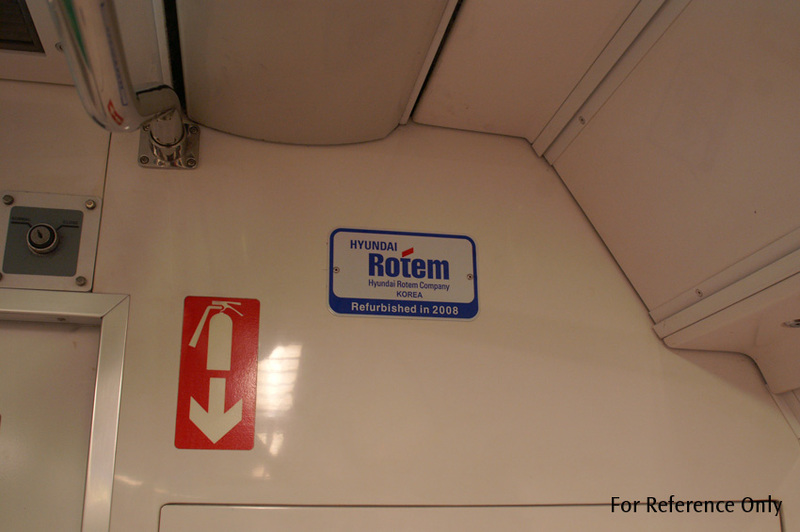 Heat emitted from resistor units is pretty high, resulting in fire and safety problems, especially with underground subway systems. The first subway train to be fitted with an Electric Chopper system is the 営団 (Eidan, currently Tokyo Metro) Series 6000, first introduced in 1968, with the concept of ‘Over 40-year usage, new technology, ease of maintenance and lightweight bodywork’. The concept came true, as the series still consists as the main fleet of Chiyoda Line in 2010, with several trains exported to Jakarta recently in 2011 as part of the fleet renewal project. 36 trains, 353 cars were made in total, opening a new page of technology for Electric Multiple Unit (EMU) type stocks. Electric Chopper technology consists of fast, variable current control thyristors, later semiconductors, alternating the electric current between ‘ON’ and ‘OFF’, to achieve an almost constant smooth supply to motors yet reduce wastage. The main benefit of the Electric Chopper is regenerative braking, the ability to change the motor into a generator and provide electricity back into the supply grid with kinetic braking effect as the primary result. An important aspect to note about regenerative braking is, without a nearby source absorbing and using the regenerated electricity, it will go off wasted. Regeneration raises line voltage, and with no nearby sources, such as an accelerating train, the line voltage will continue to rise, leading to damage of components. To prevent this, a bank of resistors (echoing the days of resistor control mentioned earlier!) helps to burn off the excessive energy, yet maintaining electric braking effect. For the MRTC system, the rheostatic chopper is set to start operating when the filter capacitor voltage rises above 830 VDC, increasing the current supplied to the resistors (known as the brake resistor/ブレーキ抵抗器) until a maximum of 880 VDC. For line voltage, the operation is coordinated with the output of power supply substations; 750 VDC for stations without load, and 785 VDC for regenerative operation of substation inverters. It must be noted that the power supply network of MRTC NSEWL is fitted extensively with inverters to absorb the regenerated energy if not used by accelerating trains, hence trains on the network rarely suffer from regenerative loss/回生失効, especially later VVVF Inverter trains which do not have brake resistor units. Japan National Railways (JNR) did not lose out to the private rails; they too came up with the first Thyristor Chopper in 1979, using a Gate Turn-Off thyristor as the main controller, and dubbed as the ‘省エネ電車’, Energy Saving Train. JNR did not last more than 10 years after its introduction, but the trains did, and the last Chuo Line units were withdrawn in 2010. Examples in Kinki Region with JR West, are still running till this date. Development of the Electric Chopper came to a climax in the early 1980s, when the 4-Quadrant GTO Chopper was introduced on the Eidan Ginza Line Series 01. The 4-Quadrant stand for the four modes the controller works on, forward mode forward motion, forward mode reverse motion and similar of the backward mode. This eliminated much communicators and complex electronic switches used on the older circuits, and the simplified controller unit not only reduced in size but also weight, making the train even more energy saving. The pinnacle of the development of Electric Chopper also meant its demise; the VVVF Inverter developed with AC motors spelt an end to DC motors which generally needed a large initial current draw. AC motors consumed much less power, and VVVF Inverter units were even more energy saving in its control methods. Although limited Cam Chopper and Electric Chopper units are still produced today, operators have looked towards the VVVF Inverter, AC motors and recently, Permanent Magnet Synchronous Motors (PMSM) as the primary propulsion system. Humans are indeed unsatisfied with present technology, and that is what drives new inventions and changes to our lifestyle. The Electric Chopper units mounted on the Contract 151 are 2-phrase 4Q-GTO Thyristor Choppers, with 4500 kVA capacity each for armature and brake choppers. Field chopper is rated 1500 kVA. Three subway rolling stocks in Japan, the Eidan Series 01 (Ginza Line), 03 (Hibiya Line) and 05 (Tozai Line) have similar equipment to the 151, however the programming for the Singapore and Japan units are different. 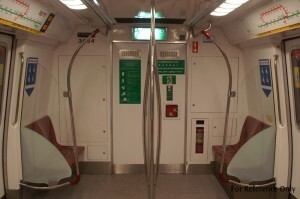 Passenger doors are fitted four per-side-per-car (eight per car). Doors are out-hanging type with general mechanism simplicity in mind and avoid complication of car-body design. 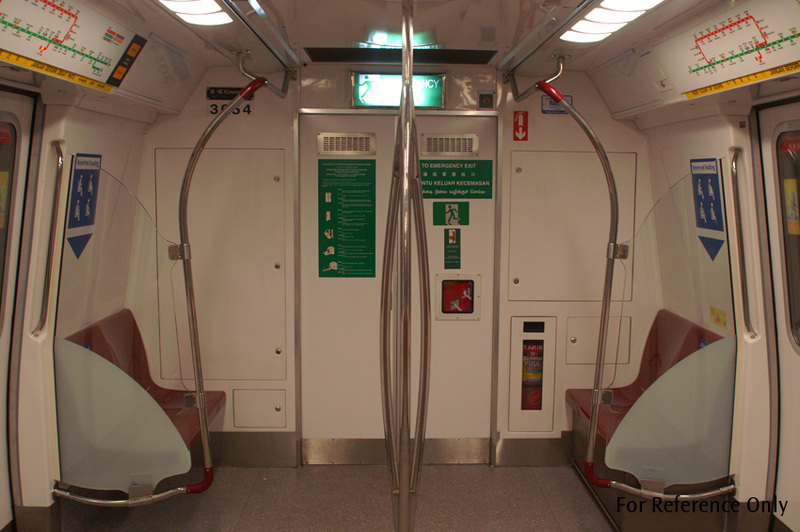 Emergency doors are provided at each end of the train, with the capacity to allow 1500 passengers to leave the train in 30 minutes. The trainset 003F was used in the launch of the trains in 1987. Subsequently all 66 trains were delivered by 1990. 051F and 121F were involved in a head-to-rear collision at Clementi station during morning peak hours on 5th August 1993, causing injuries but no major damage/casualties. Residue oil on the tracks caused the following train to lose adhesion and collide at low speed onto the train stopped in the station, which had its safety system triggered due to the depletion of compressor air while attempting to stop previously. Human error and untimely response was blamed for the oil leak from a works train the previous night. The two trains were returned to service later. A consortium of companies headed by Hyundai Rotem won the 142.7 Million Singapore Dollars project to refurbish the 17-year old trains in 2004. Seats were configured to be larger, but reduced from 9 to 7 per row. Panels were replaced and flooring changed. The first refurbished train entered service in 2006. As at 2011 all trains are refurbished. Type: 4M2T, 6-car train Commuter Metro train formed by two 3-car EMU. Service: 3.6 km/h/s (1.0 m/s), pure electric, combined electric-pneumatic, pure pneumatic based on conditions. Emergency: 4.7 km/h/s (1.3 m/s), pure pneumatic friction system. This is to simplify the denotation of trainsets. The propulsion system on the C151 are facing problems associated with aging. DC motors are also increasingly phrased out by operators throughout the world, leading to fewer supplies by manufacturers and difficulty to source for parts. 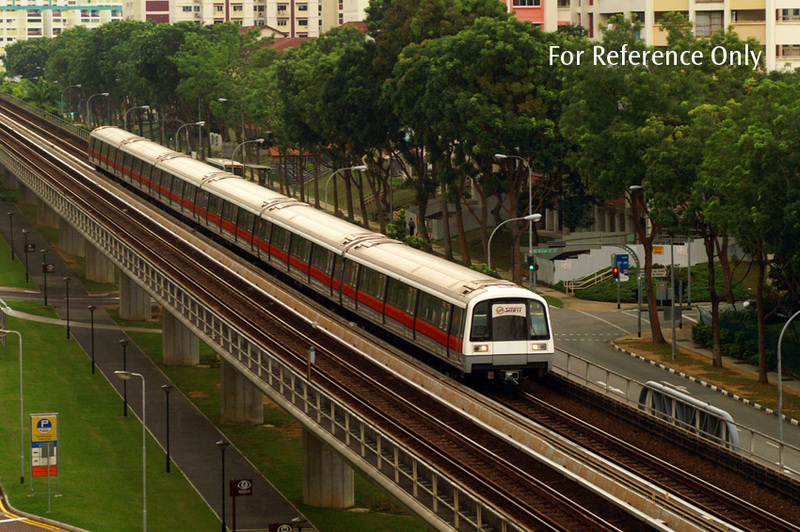 On 4th July 2013, it was announced on the Toshiba Corporation website that they were awarded a propulsion change-out program by SMRT Corporation comprising of PMSMs, VVVF Inverters and associated equipment for 396 cars of the C151 fleet. The introduction date was slated to be early 2015 for a total of twelve cars (Four 3-car EMUs), after which a trial period of 1 to 2 years would commence before all cars are replaced with the new equipment. The first four 3-car EMUs, 055F and 131F comprising of twelve cars in total commenced revenue service in 2015 on the North-South and East-West Lines.